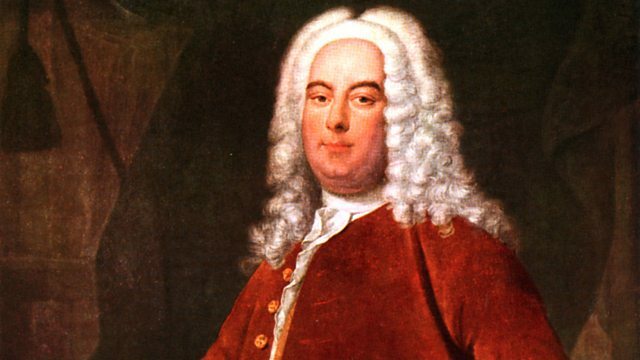 BBC Radio 3 - Composer of the Week, George Frideric Handel (1685-1759), God Save the King! Donald Macleod focuses on what happened to Handel after the death of George I. This week, as part of the BBC's Eighteenth Century season, Donald Macleod explores the music Handel composed for the Georges, I and II, and to commemorate major events in their reigns. Today, George I dies, unexpectedly and unconventionally ? 'of a surfeit of watermelons' is the official word. One of his last constitutional acts was to sign Handel's naturalization papers, and now that the composer was a true Brit there was no bar to his composing the music for the new king's coronation. By all accounts the performances on the day were chaotic, but the scale and magnificence of the music made a lasting impression on those present, and has set the tone for coronations to this day. Handel's deeply competitive leading operatic ladies, Francesca Cuzzoni and Faustina Bordoni, set very much the wrong tone when they scrapped in front of Princess ? soon to be Queen ? Caroline; the King's Theatre, Haymarket, descended into chaos during a performance of Bononcini's opera Astianatte, as the two prima donnas screamed abuse at each other. Happily, no such excitements marred the première of Handel's new one, Riccardo Primo, an opera about Richard the Lionheart ? the perfect subject-matter to mark the new king's accession. Choir: Choir of Westminster Abbey. Orchestra: The English Concert. Performer: Trevor Pinnock. Conductor: Simon Preston. Choir: Monteverdi Choir. Conductor: Sir John Eliot Gardiner. Orchestra: English Baroque Soloists. Choir: King's College Cambridge Choir. Orchestra: Academy of Ancient Music. Conductor: Stephen Cleobury. Orchestra: Basel Chamber Orchestra. Director: Paul Goodwin. Singer: Lawrence Zazzo. Singer: Núria Rial. DEUTSCHE HARMONIA MUNDI : 886971742-12. Orchestra: Basel Chamber Orchestra. Director: Paul Goodwin. Singer: David Wilson‐Johnson.